Antonia Carding, CAISS Team Manager and Head of Child and Adolescent Mental Health Services Nursing at the Tavistock and Portman NHS Foundation Trust (TPFT) describes how the Camden CAISS service provides crisis provision and risk support across the system. In Camden referral boundaries between CAMHS teams have been removed, meaning children and young people (CYP) can access clinical expertise from different parts of the service at the same time, in which ever configuration best meets their needs. All records are kept on the Carenotes Electronic Record System, meaning that when a request for help with a case comes in to one part of the service, an integrated offer is supported. What was the service hoping to achieve? Camden does not have an inpatient setting within the Borough. As a result of young people often having long stays adolescent inpatient units, a long way from home, CAISS was set up in April 2016 to address the specific need of adolescents in crisis in Camden, and to ensure equity of access to crisis provision across the Borough. How does this fit into local i-THRIVE plans? CAISS provides Getting More Help to young people with significant mental health needs. However, within this group there are young people whose mental health needs have not improved as a result of interventions, or are not able to engage with interventions for a number of reasons, alongside those who are recovering from a mental health crisis but where other risks remain. Therefore, some CYP whose needs fall within the Risk Support needs based grouping are also supported through this service. The team work flexibly with the existing professional network to develop Risk Support plans with shared responsibility and accountability across sectors. 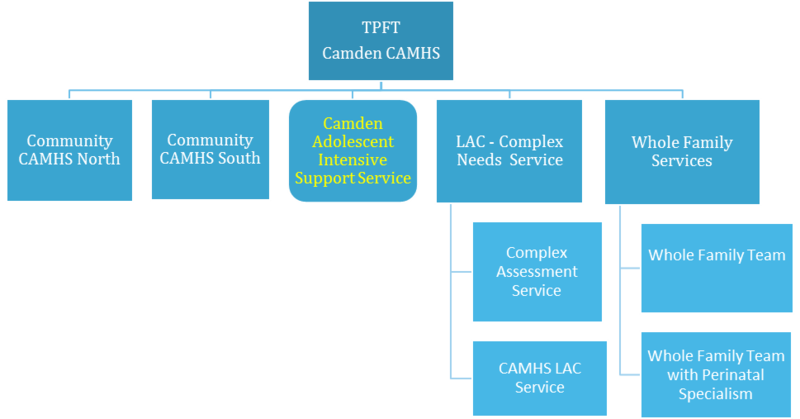 What approach did you take to develop the Camden Adolescent Intensive Support Service? The service is nurse led and is open 9am-5pm, Monday to Friday, covering a population of 44,280 under 18 year olds. CAISS is an intensive support service for young people and families, aged 11–18, who need significant extra support to help manage a deterioration in their emotional health. We are short term, flexible service, who’s aim is to work with young people and their families for 3-5 months, with the goal of reducing crises by actively managing risk taking behaviours through intensive support across a variety of locations. The service takes a holistic psychosocial approach to treatment. How has this approach affected service users? Regular Experience of Service Questionnaire (ESQ) data is collated from both young people and their parents/carers and this is feedback to improve service development, as appropriate. Examples of improvements made include the development of a 6 week parent/carer psychoeducation support group focussing on different aspects of mental health and wellbeing and ways to support their children, and a trial of a Dialectical Behaviour Therapy (DBT) group for young people. What are the implications for staff? How are they working differently? There is a strong emphasis on developing the consultation skills across the service. The service is led by need, rather than severity and diagnosis, and as such we do not have a threshold for involvement. Our team culture is strongly weighted on clinical discussion and supporting reflective practice across the system to support referrers to build their capacity and move language away from “this is not for us” to “can we offer this child or family the help or support they need right now, and are there other individuals or services within the young person’s existing network that might be able to support their increased needs at this point in time?” Shared decision making with the young person and their family is fundamental to this process to facilitate improved outcomes and/or reduce the likelihood of further crises. How has the service enabled a needs-based approach for service users? Commitment to consultation and supporting networks to build capacity and reduce inappropriate referrals across the system for young people of concern. Over 50% of our closed cases in the past 2 years have been closed to our service through signposting or bridging to the voluntary sector, rather than to further tertiary mental health services. The team has a strong ethos on building on existing resilience within the young people and their family and wider support network, and utilising the community and resources around them to support them in the longer term, rather than an over-reliance on services. Flexible in attendees at appointments: parents or carers, school staff, social workers, individual, with friends, etc. Known to local CAMHS service. Significant decline in mental state and 3 presentations to local A&E department following serious suicide attempts. Likely inpatient admission if no change to care plan made. CAISS team “bolted on” to existing care package within the CAMHS team to offer intensive support in the community to focus on her understanding and reducing risk taking behaviours. The young person and family were seen daily for 3 weeks. A combination of family work and individual sessions were offered in a variety of locations e.g. at home, school, clinic, and local café’s. After 3 weeks of daily contact improvements were being made. The young person felt less intensely suicidal, parents felt more equipped and supported in managing the young person at home, and the young person had started a reduced timetable back to school. Sessions reduced to twice weekly with regular review with CAMHS team. After a further 3 weeks there was significant improvement across the whole system, with agreement that the crisis had passed, and that the existing care package with the community CAMHS service could continue. Outcomes: Inpatient admission avoided, no further A&E attendance, parents and the young person felt safer and happier working together at home, with improved communication within and between the network. Integrated multi-agency approach with joint accountability and responsibility for outcomes. Particularly focused on looked after children (LAC). Crisis plans co-produced between CAISS and young people and/or their families. Plans are often shared with schools as part of an agreed shared care plan. Inpatient admissions as last resort when community placement is no longer sustainable due to concerns regarding safety. Known to local Eating Disorder service: 3 years of intensive treatment including day hospital, family therapy and individual psychology. 4 attempted suicides in a 3 month period, increasing in severity and intent. On 4th admission unable to engage in safety planning with existing community CAMHS team. CAISS bolted on to support existing team and offer a dialectical behavioural approach to risk management. Visited daily in paediatric ward for 4 weeks, no improvement. Agreed inpatient admission for Risk Support with focus on further assessment of mental state and ensuring safety. Consequent Mental Health Act Assessment in week 1, detained under Section 2. Upcoming project to hold focus groups with our young people to ensure their co-constructed crisis plans and care plans are young people friendly and meaningful. How does this service address interagency working and integration? Attendance at the Camden Service Line Leadership meeting: Team leads meet on a regular basis from each service within the service line to enhance integrated working and discuss complex cases to ensure seamless transitions for young people and families given their presenting needs. This forum helps reduce waiting times across the system. Borough-wide inpatient and crisis meeting: attended by service and strategic leads from cross-sector partner agencies to facilitate closer working relationships across health, education, social care and the voluntary sector to support integrated whole system provision. Regular, robust liaison with Camden Education and Inclusion team supporting mental health assessment, treatment and recovery alongside active education provision in alternative environments: hospital school, small learning groups, mentors, home tuition. What challenges have you faced and how are they being addressed? What have been the key achievements of the service? In 2017, we were shortlisted for Team of the Year for the Nursing Times Awards. A Channel 4 documentary: “Kids on the Edge” was made about our service and aired in 2017. For further information about CAISS, please contact Antonia Carding at ACarding@tavi-port.nhs.uk.